Seated, pads positioned just past the knees, feet on calf block with heel and arch extending off, raise heel by extending ankle as high as possible and then lower back down. Adjust the knee pad so that your legs fit just barely underneath. Legs should be about shoulder-width apart or slightly narrower. Stretch as far up on your toes as possible on the top and take the heel down to a comfortable level on the bottom. Use a smooth, controlled motion. In addition to being less effective, going fast and using momentum on this exercise makes you look really goofy. Go slow, focusing on getting a good stretch at both the top and bottom. Pointing the toes slightly inward can place more emphasis on the outer calves while the inner calves can be better targeted by pointing the toes slightly outward. A lot of bodybuilders skip this exercise simply because it emphasizes the soleus muscle in the calf. The soleus muscle is primarily underneath the gastrocnemius muscle which is the visible muscle of the calves. Keep in mind though, increasing the size of the soleus can push the gastrocnemius muscle out making for bigger calves. Barbell Seated Calf Raise – With a barbell positioned above the knees for resistance. 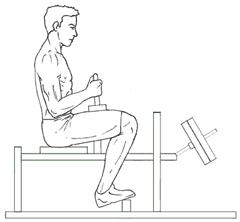 Other Machine-Based Seated Calf Raises – Smith machines can allow you to do a version of Seated Calf Raises. In general, the calves are a tough muscle to target (in terms of a variety of effective exercises). This is even more true of the soleus muscles that Seated Calf Raises target. The key to targeting the soleus is to do the raise with the knees bent. A Bent-Knee Calf Extension (on a lever machine, you push down on “pedals”) is a good alternative if you can find it. Keep in mind though, all calf raises will work and will develop the soleus along with the entire calves, they just won’t emphasize the soleus muscles quite as much as when you are doing a bent-knee exercise. Find out how to pick the right program for you based on your training level.